We got snowy Sharnhorst & DoY, now can we please get a tier 7 snowy map to play on for a change? So we have snowy camos now ... the only problem is that at tier 7 there are no maps on which this camo is appropriate. 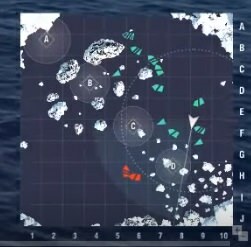 We need more North Atlantic maps in this game. Every map is either desert or tropics. They even removed Ocean, which I think was a terrible decision by WG ... removing the one and only historically accurate map. Islands of ice is almost exclusively tier 8-X, very few tier 7-9 battles are played on it. Please gives us more cold weather/ice maps. It destroys any sense of immersion when you spawn on a desert or tropical map ... with your ship completely covered in ice. And an Italian Candy Cane with it please. Ideally I'd like to see different weather variations on each of the maps (well, I guess not on Ocean). And more maps. Uh by that logic when can we get the map where it's painted stars and stripes? Not really, one is weather related and the other isn't. The "Islands of Ice" map, but from the time of WoWS launch. I live in Pennsylvania. If I want Icy Immersion, I'll open the window blinds. The Scharnhorst is one of the most popular ships in this week's Scenario.. Yet I was the only one I've seen with Icy camo. Methinks not many people are that interested in the collections or campaigns. Why the hell did they change it? The original islands of ice was so much better than the sh*t we play on now. lmbo I was just thinking that the other day. In WoT, different camo are automatically equiped (if player has them), on different themed maps. For example, brown desert camo on sand maps. But that system did not get transferred to WoWS, for... whatever reasons. WG's really bad at transferring good things from WoT to WoWS.